I am so excited to be blogging on behalf of the #WeTeachSped ladies! It is Halloween Eve and I am guessing you spent the day celebrating with you little ghosts and goblins in the classroom. 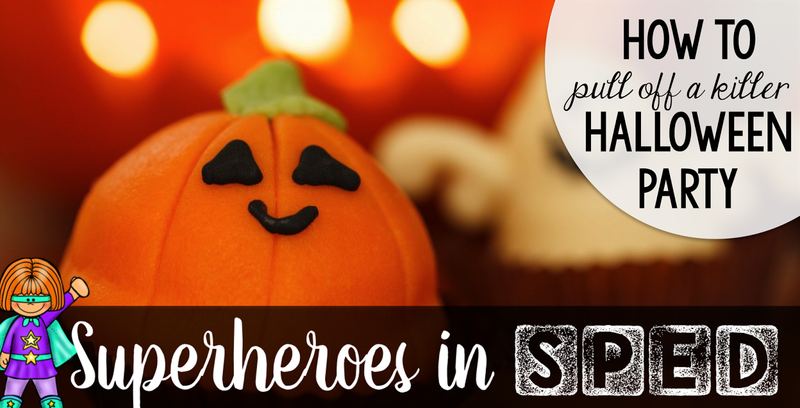 Halloween is the beginning of the holiday season and that means LOTS of holiday parties in the classroom. My special kids don't always find these events enjoyable and it can be stressful on myself as the teacher as well! So let's do what we special ed teachers do best....problem solve how to pull off a successful classroom holiday party! Problem 1: I have a multiple grade level classroom. How do my students get to be with their grade levels peers and how do I appear in two places at once! Solution: I struggle with this every year! I am a 2-3 grade self contained teacher and I am not a magician so I have to make enough face time in each party without favoring one grade. Use your paras as much as possible. I am lucky enough to have 3 paras so I send 2 into my larger half of the class and 1 with the smaller. This really helps give the kids support if they are having a hard time, give the parents some FaceTime with their students daily staff, and can keep me posted if I am needed in a room. We take walkie talkies or use VOXER (a really fun walkie talkie app) to contact each other. If you do not have enough support staff to help out talk to your principal and see if you can borrow someone else in the building to help out such as a gen ed paraprofessional. Its not perfect but it will help your students get the most out of a great social opportunity. Solution: This is a tough one because parent/teacher relationships can be complicated. I have been cornered for the entire holiday party my first year teaching by a parent talking about their child's progress. I made a PROMISE to myself that I would be prepared if that ever happened again. Mingle around the room and say hello to everyone in a group, this will help specific student progress questions to be limited. Another solution is to use your para pros as a buffer. If they see you unable to politely leave a 1:1 conversation with a parent. It may be uncomfortable but you can always say "I would love to discuss this with you, but lets set up a time to talk on the phone. I would hate for Johnny's personal information and progress to be overhead". The parents will appreciate you listening to them and setting up a plan to help find a solution to the problem in a more appropriate setting. Problem 3: My kids are having sensory over load the noise, number of people in a small place, and decorations can cause the kids to have a melt down. Solution: This is something that should be individualized to each need but some things that I use to help with sensory overload during a social opportunity- headphones for friends who don't like loud noises. Break cards for students to leave the room and come back as they please. A special toy that helps them find comfort...this can be a fidget, a "magic hat" (yes we use magic hats on many occasions for one kid on a daily basis). Lastly, preparing the kids will help them deal with their sensory needs. Social narratives, schedules, and timers will help ease their stress to the over stimulation. Problem 4: The schedule in your classroom is turned upside down due to a party, parade or other celebration! Solution: This is an easy fix, but takes some prep. Make sure you have the appropriate social stories have their visual schedules set up and ready to go and refer to them through out the day. Parties and new people can make our students become very anxious and it helps to be overly prepared! I hope you all enjoy your Halloween and the kick off to the holiday season! Make sure you check out my TPT store to find some resources for the special kids in your classroom! Summer is highly associated to beaches and as you already know Hawaii is a good destination. You can plan a Hawaiian style holiday party for your kids. There are a lot of things that you can incorporate in the party like Hawaiian music and costumes like grass skirt.